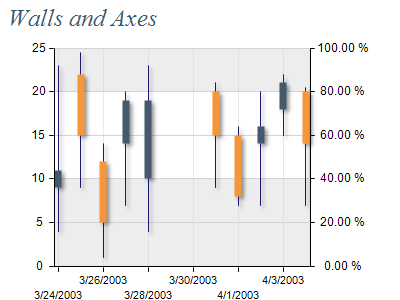 This screenshot demonstrates the following capabilities: adding axes to the left and to the right of the chart back wall; using different and, by need, synchronized scales; using grid lines and major ticks; applying different styles to axes; using stripes; staggering axis labels. This screenshot demonstrates the following capabilities: adding synchronized detached axes; rotating axis labels. This screenshot demonstrates the following capabilities: using const lines; using stripes. This screenshot demonstrates the following capabilities: using major and minor ticks; translating the coordinate system center; using major and minor grid lines. This screenshot demonstrates the following capabilities: using logarithmic scale; setting custom axis label format.